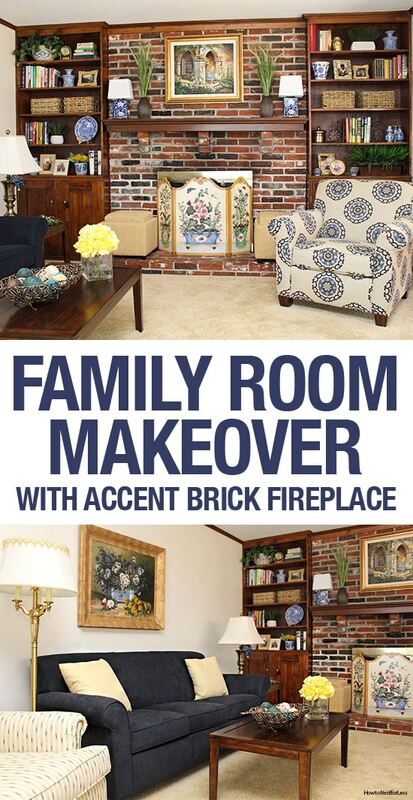 I have to say this is one of my favorite makeovers to date. My parents left for a week in Jamaica to celebrate their anniversary and I completed the room transformation in just 7 days. I’m basically the best daughter ever, right? So let me back up a bit… My parents’ family room is really more like a den. 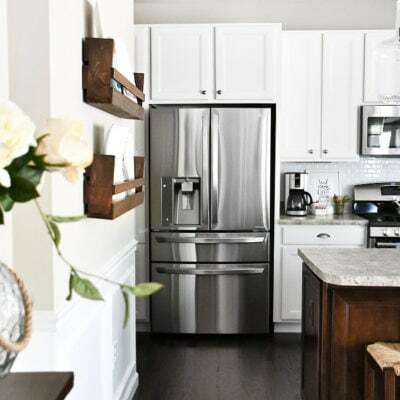 It’s a smaller room off the kitchen with dark built-ins and wood trim. And plaid couches. Yes, amazingly awesome blue and yellow plaid couches. 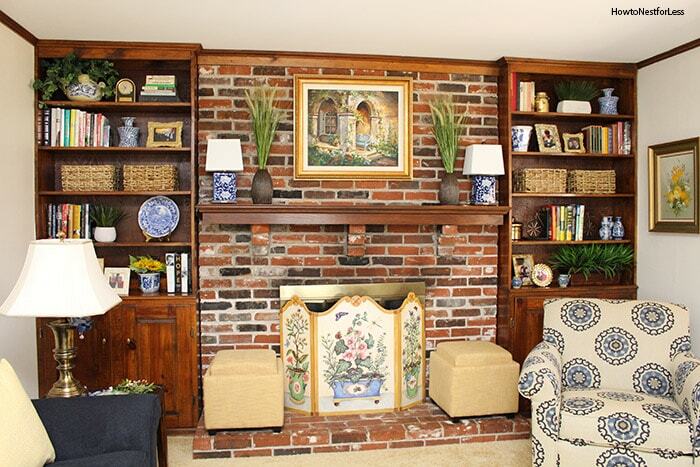 So my parents’ only request in this room makeover was to keep the bookshelves natural wood. While 3 different interior designers suggested we paint them bright white, I was 100% fine with keeping the bookshelves dark (which is why I ultimately was given the green light to makeover this space myself over the designers!). 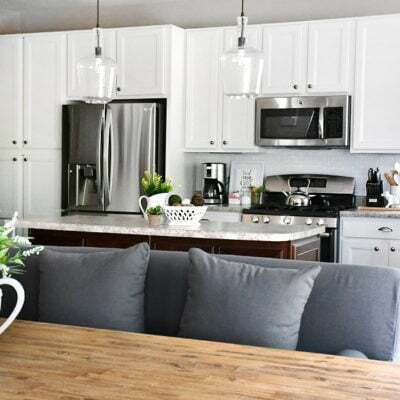 The biggest thing that helped brighten the room was actually a minor adjustment: taking off the middle doors from the built-ins. The doors were shutter-style and made the wall seem much darker. Plus now we’re able to have 2 more shelves on each side to spread out their overgrown book collection of literary classics, Lance Armstrong biographies, romance novels, and popular diet fad books from the 80s. 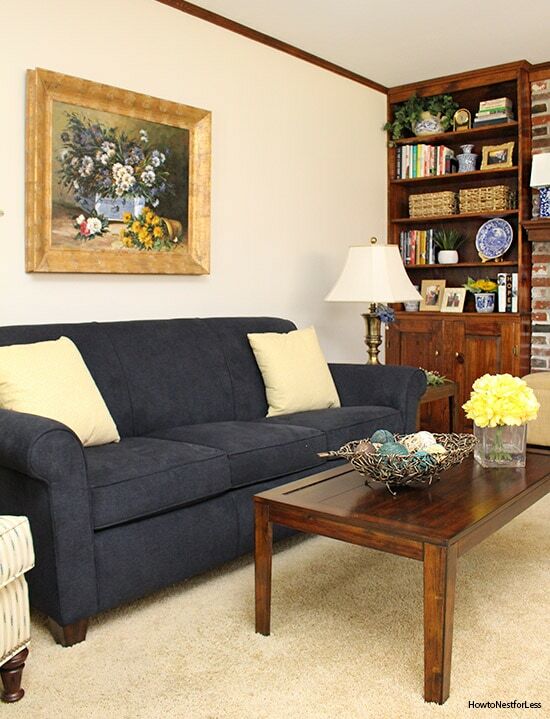 Even though we kept the built-ins dark, I wasn’t afraid to chose navy blue couches for the family room. The white walls and creamy yellow carpet really balance the space. 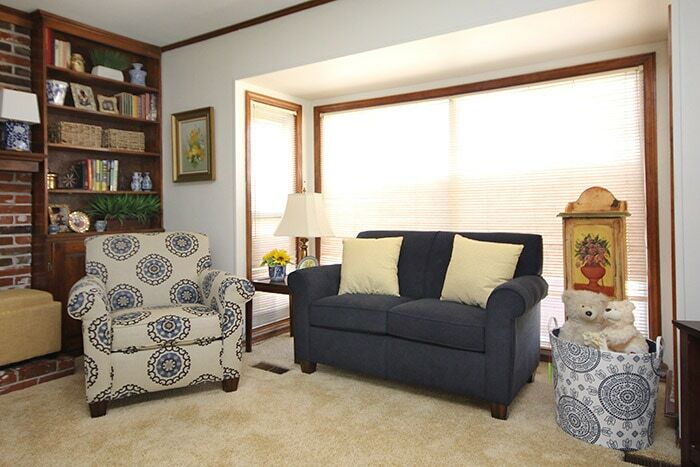 Since we chose a smaller couch and loveseat, we were also able to squeeze in an extra chair in the corner near their french doors. 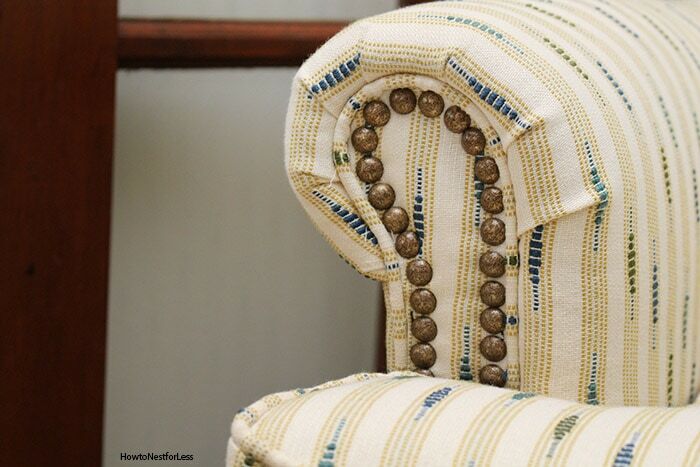 Love the nailhead trim on this piece, not to mention the yellow, green, and blue striped fabric. 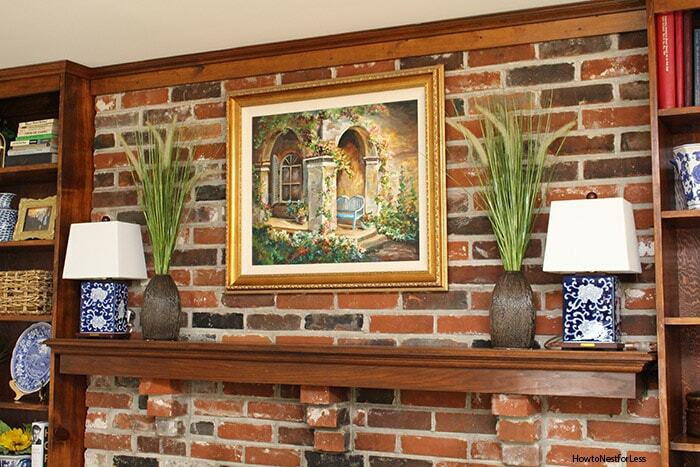 My parents’ house is very colorful so this was an upscale way to infuse her color scheme. I purchased some new tables for the room as well from the local big box store Weekends Only. I seriously searched high and low for the perfect tables and then found this set: coffee table and two end tables for $195. And the wood pretty much matches perfectly. 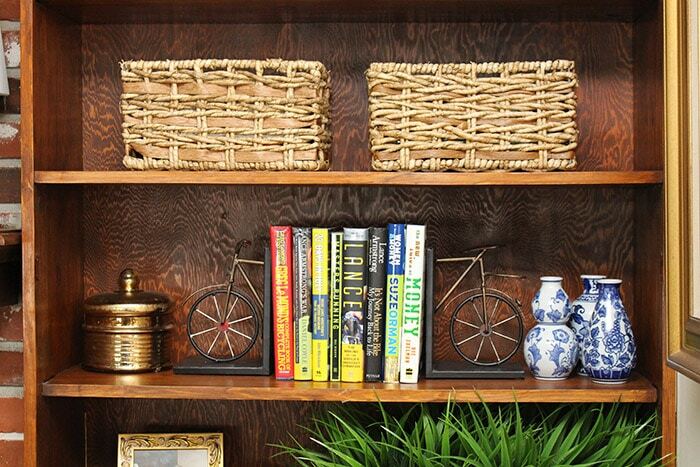 It was a lot of fun styling these bookcases. I organized the books by the Dewey Decimal System… just joking. I just categorized them like any normal human. I also added 2 baskets on each side for extra storage of odds and ends. I also added a bunch of personal touches. 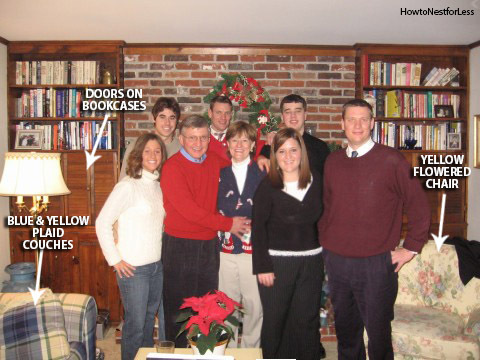 Lots of family photos and awesome bicycle bookends that I found on Amazon. Told you my dad had a thing for Lance Armstrong. My mom also has a lot of blue Spode blue dishes in her adjoining kitchen so I carried that into their family room design. I even cleaned out their lower cabinets for them (yeah, I’m pretty much the best kid ever). 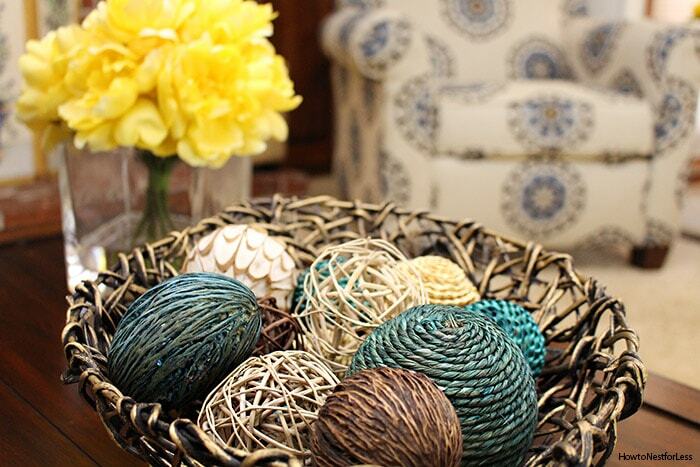 I used baskets from Spectrum Diversified Designs, Inc., the same ones I used in my coat closet makeover. LOVE them. 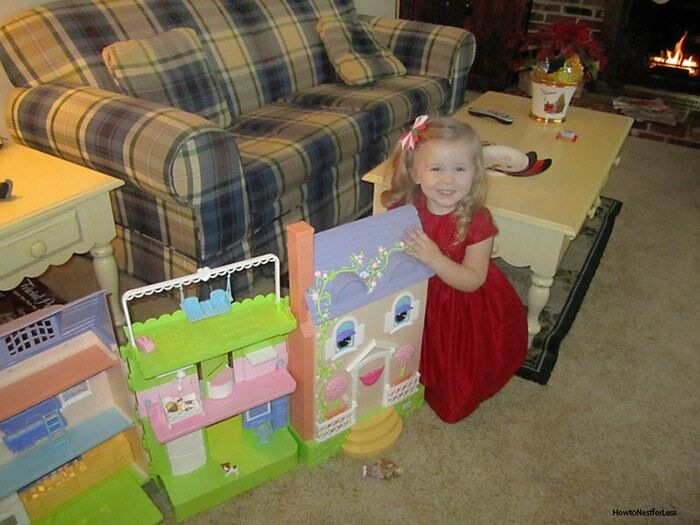 Now all of the grandkids’ toys are organized. On the mantel is an old painting that my parents have had for years (use what you have, right?). I evened out the rest of the fireplace mantel with two large plants and blue ceramic lamps I found on clearance at TJ Maxx. 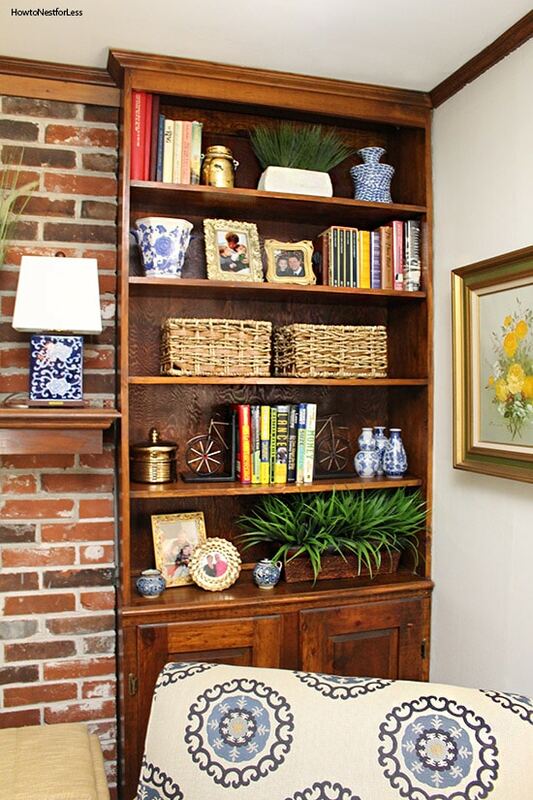 It’s funny, when the shutter doors were on the bookshelves you couldn’t see that there were outlets back there. For the lamps we just drilled little holes in the side of the bookshelves for the plugs to fit through. 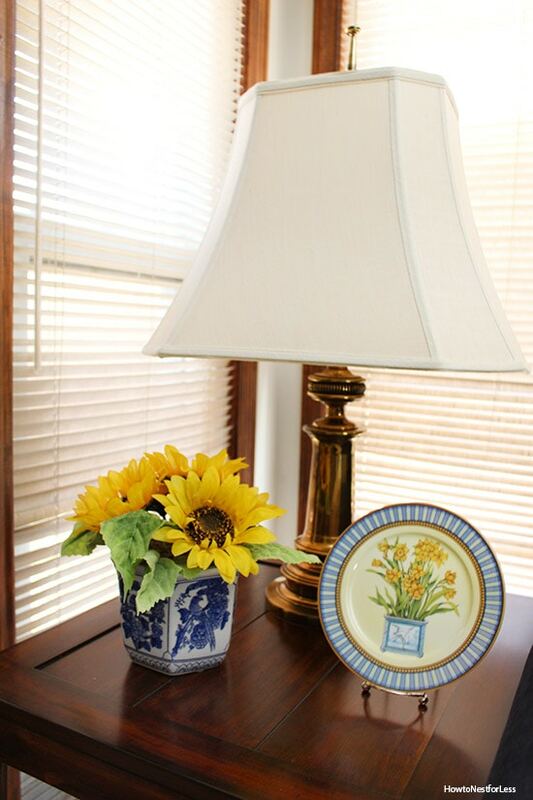 Since their home is older and doesn’t have a ceiling light, these lamps really helps brighten up the space. 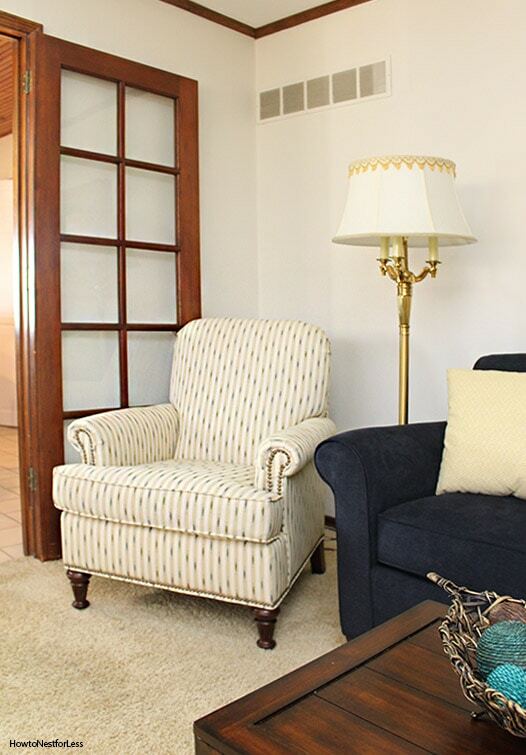 On the right side of the built-ins sits a new upholstered chair. 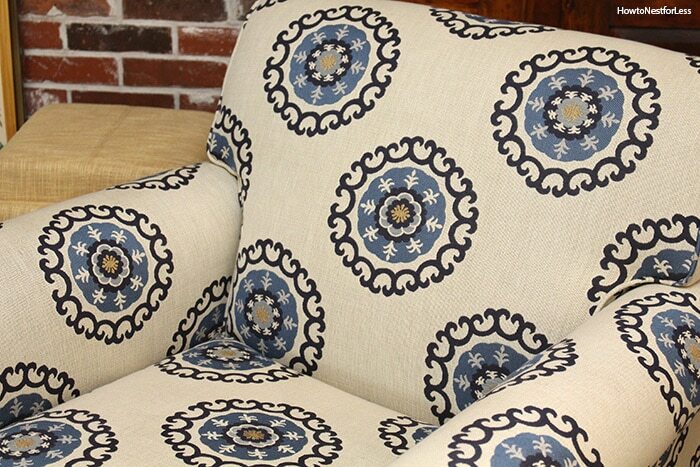 LOVE this medallion fabric. 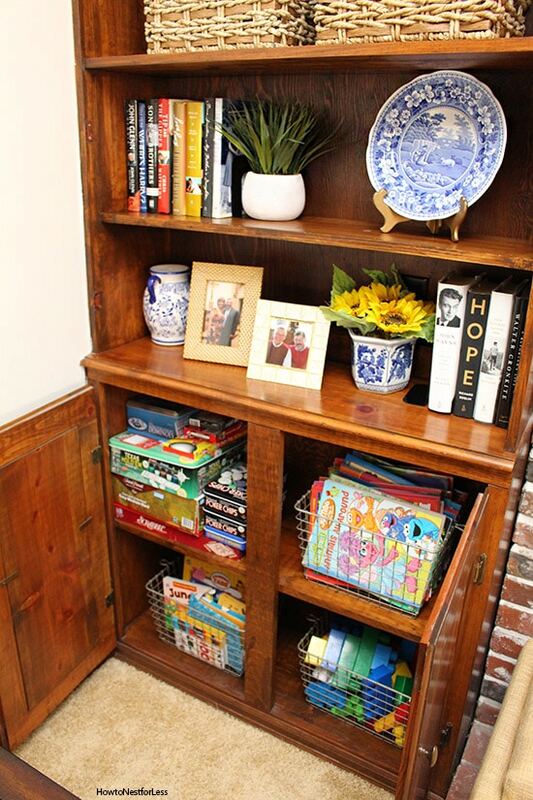 All the furniture is from a local STL store called Carol House. You basically pick the style of furniture and the fabric, then it takes about 8-10 weeks to come in. 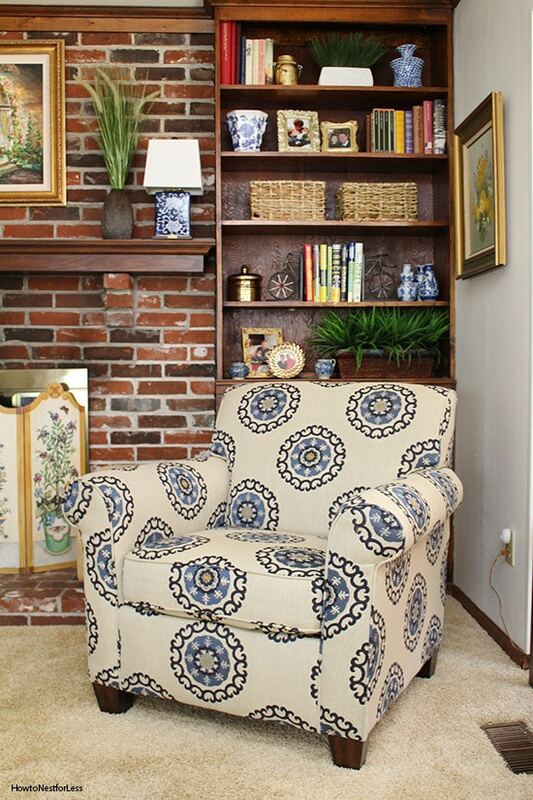 This chair is super comfortable and the perfect place for Papa to sit with the grandkids and read books. 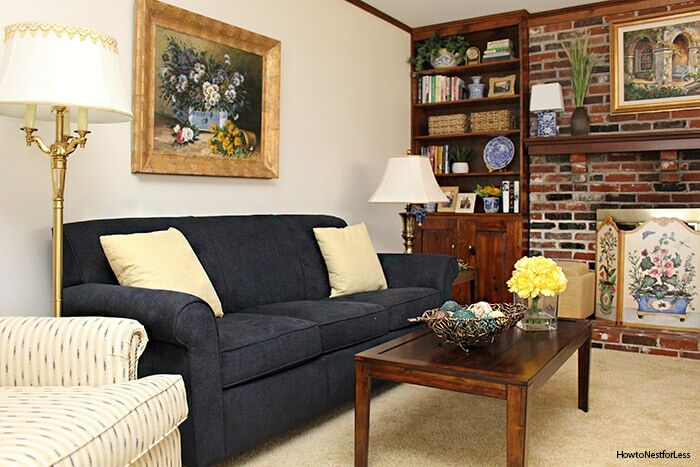 On the right side of the room sits the navy loveseat with yellow accent pillows. There’s a subtle pattern on the pillows, just hard to see from far away! 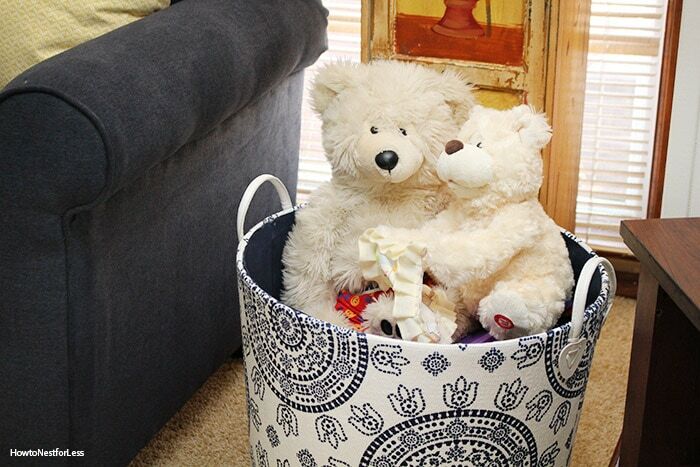 We also added a deep bin from TJ Maxx to store more toys. Yes, the grandkids have taken over. But as I’ve mentioned before we have Sunday dinners over here almost weekly and we need to keep them entertained. My mom texted me on Monday night and sent me a photo of her fireplace… she ripped off the brass surround! Guess it’s been on her mind for ages too 😉 Guess I have a new project for this weekend! It looks great! LOL at the Dewey decimal system. You had me there for a moment! Looks Great! Love the chair from Carol House! I think you did a great job! It looks good. You did a great job! 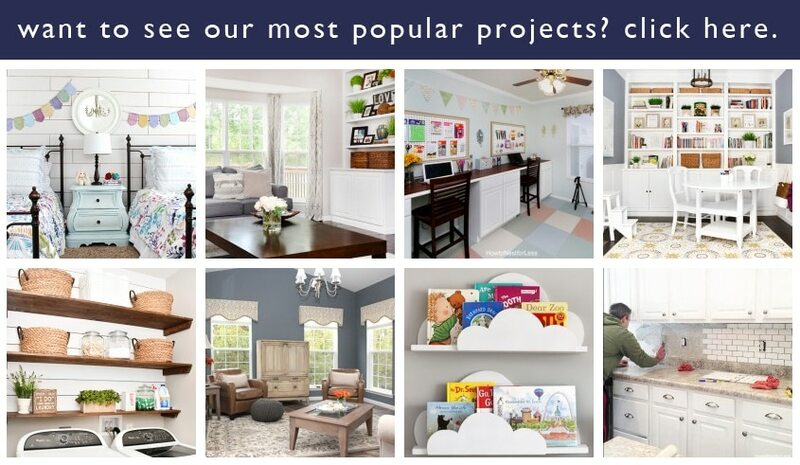 Love everything except…….that table with the scalloped trim, did you get rid of it? I so want that in my cottagey-farmhouse. I don’t like the coffee table or end tables. Just personal like/dislike. 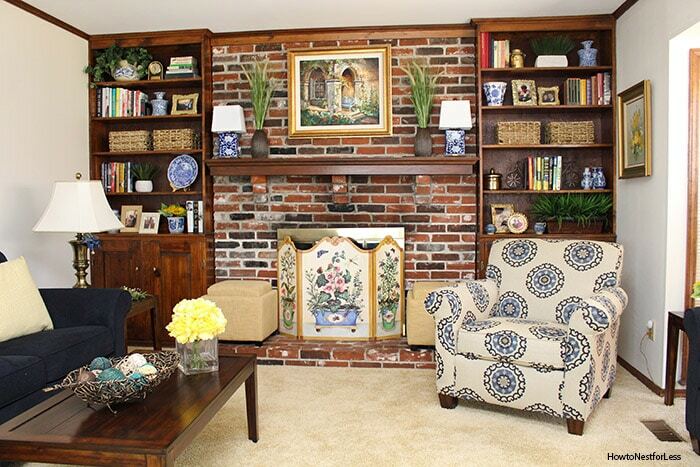 Really love that occasional chair and fireplace screen and the blue/white china. I collect that. Need to stop, running out of space…..
My sister is using the yellow tables in her new home so they are at least getting a new home! Love this make-over , because it REAL! 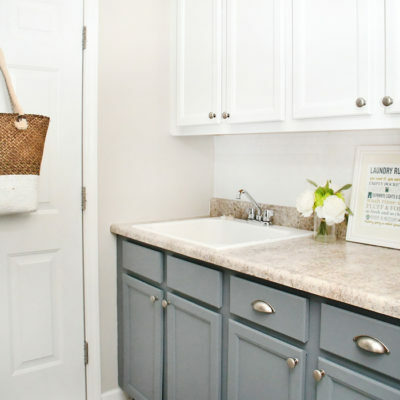 Using things that are already there and incorporating new stuff to the room. Not everyone can afford a complete make-over and I for one don’t want to get rid of things that are meaningful to me and still purposeful! I too like the wood and glad you kept that!